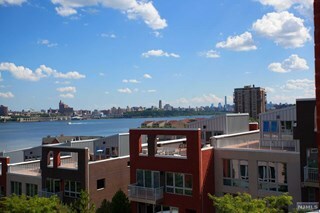 Vela Townhomes: Built in 2007, this very modern Italian-style architecturally inspired luxury townhouse complex, built by the award winning archictural design firm, Arquitectonica, abuts the Hudson River on its own peninsula. At the tip of this u-shaped community, which affords views to every unit, is a community swimming pool and clubhouse. The public Hudson River Walkway circumnavigates the complex. Not only was Vela Townhomes a major breakthrough in ultra contemporary design within the Edgewater landscape; it was the first multi-dwelling complex that was built for the high-end homeowner. 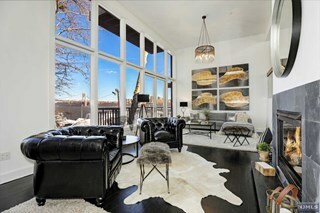 This contemporary designed brick faced complex with ultra modern design, opened kitchen and huge rooftop terraces with expansive views of New York City from the George Washington Bridge to the Statue of Liberty, is the epitome of luxury and has brought a new kind of buyer to the Edgewater luxury market. The complex is located across from the new George Washington School and some of the finest restaurants in the town including The River Palm Terrace and Le Jardin Garden. The 29 sleek and modern units, approximately 3,600 square feet and above in size, feature 3 levels of sophisticated living space, each with an outdoor rooftop deck of approximately 1,000 square feet. Features include 9’ ceilings, sunken living rooms with fireplaces, open kitchen layouts that include Sub-Zero and Viking appliances, honed granite counters and marble backsplashes, Brazilian cherry wood floors, enclosed solariums, elevators and walk-in closets. The master bedroom suites are oversized. Just outside the complex is the #158 bus, taking you to The Port Authority in about 30 - 45 minutes. Free shuttle service is provided by Edgewater to the Edgewater Marina & Ferry. All major highways and The George Washington Bridge are less than 1 mile north of the complex and the major shopping areas within Edgewater are within 1 to 3 miles south of the complex. 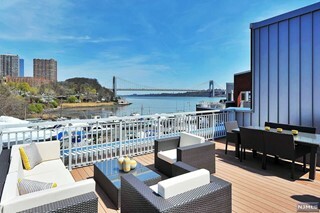 Each townhome has its own rooftop terraces with NYC views and 2-car garage. There is a riverfront swimming pool and a community room. The public Hudson River Walkway circumnavigates the complex (which is elevated above it).